It’s great to be a employee in Colombia because there are a bunch of Colombian public holidays, 18 to be exact. Since we are in August and I’ve already written about The Battle of Boyaca I would like to shed some light on The Assumption of Mary. I really love theology, I think it’s amazing how millions blindly follow a doctrine. Colombia is no different than any other country when it comes to devotion. The primary religion in Colombia is Catholicism. Catholicism was introduced in the early 1500’s by the Spanish. Today 90% of the population is recorded to be Catholic. There are over 120 different religious orders, institutes, and lay organizations running hundreds of primary and secondary schools, hospitals, clinics, orphanages, colleges, and 8 universities. Assumption Day is celebrated annually on August 15 in Colombia and is known as La fiesta de la Asunción de la Santísima Virgen María. Holidays are an excuse to party in Colombia. Some countries celebrate the day at other times of the year. This day is also known as the Assumption of the Blessed Virgin Mary, the Dormition of the Most Holy Mother of God (in the eastern countries), or the Feast of the Assumption. Why do we get Monday off? First of all, one should know that if one is Catholic one is obligated by Canon Law to go to mass on this day. Can. 1246 §1. Sunday, on which by apostolic tradition the paschal mystery is celebrated, must be observed in the universal Church as the primordial holy day of obligation. The following days must also be observed: the Nativity of our Lord Jesus Christ, the Epiphany, the Ascension, the Body and Blood of Christ, Holy Mary the Mother of God, her Immaculate Conception, her Assumption, Saint Joseph, Saint Peter and Saint Paul the Apostles, and All Saints. Link to the Code of Canon Law at the Vatican. Notice that Holy Mary the Mother of God’s Assumption is listed as a obligatory holy day. I’ve searched and nowhere in the Code of Canon Law does it say that a Feast Day can be transferred to a Monday. Yet in Colombia, pretty much all religious holidays are celebrated on Monday. This is because a law was passed in Colombia in 1983 that declared some holidays to be observed on the ensuing Monday, Ley 51 de 1983. Real Catholics will actually go to mass on Friday, Sunday, and again on Monday. Most Colombians, Catholic or non-catholic, usually travel to small towns or hang out at fincas (country houses) in the surrounding area. In general, holidays are spent with family in Medellin. Medellin is typically a ghost-town on holidays, even large chain stores like Exito are closed. It’s best to get out of town and enjoy some of the pueblos near Medellin. Don’t even try to go out and party on Sunday in Medellin. All nightclubs and restaurants are closed, even liquor stores, so stock up and invite people over to your apartment and play parcheesi, Colombian’s love the game. Death and Assumption of the Virgin by Colla del Amatrice can be found at the Capitoline Museums in Rome, Italy. 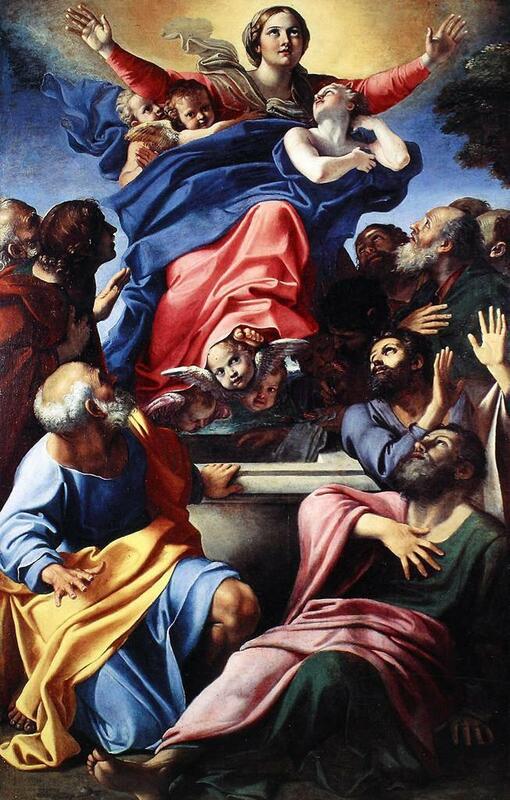 Assumption of the Virgin by Annibale Carracci – 16th Century – The first canvas was completed in 1590 and is now at the Museo del Prado in Madrid, Spain. The second is from 1600-1601 and is in the famous Cerasi Chapel of the church of Santa Maria del Popolo of Rome. There are a bunch of Colombian public holidays, 18 to be exact. Assumption Day is celebrated annually on August 15, this year we have Monday, the 21st off.